"There they are boys!" yelled Taskmaster Vorgris, lifting his rusted blade across the ruins of the old Cathedral of Saint Bubba. "They claim we believe in a false God! That the Lord of Ruin is only a servant of their God of Decay, when we know he serves a much older god. A pure god!" "DOOooom! DOOooom!" the platoon yelled behind their masks and rebreathers. Vorgris felt a brief pang of disappointment. Not exactly the rousing cry.... more like a muffled grunt. But the growling of the tank engines nearby was threat enough as the enemy meat puppets ambled forward. "FALL TO YOUR KNEES, NON BELIEVERS! AND EMBRACE DOOOOOOOM! OR DIE!!" He bellowed across the field. A resounding thunder of heavy guns was the answer. He looked to their stoic commander, who failed to even flinch as his men grabbed cover. He may have been napping standing up... he did that sometimes. 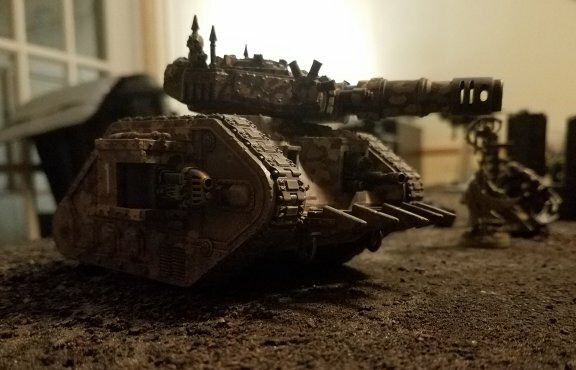 Heavy shells crashed next to the Leman Russ Punisher affectionately names "Raspberry" by the men. He also wondered where 4th squad was. BRRRRRRRRRRRRRRRRRRRRRRRRRRRRRRTTTTT!!!!!!!! Raspberry cut loose on a hoard of shambling walkers. The dust mingled with red and brown mist. As it settled, a few bits of flesh twitched in the sand. The last view of a hoard of Poxwalkers. I FINALLY GOT TO PLAY A GAME!!! 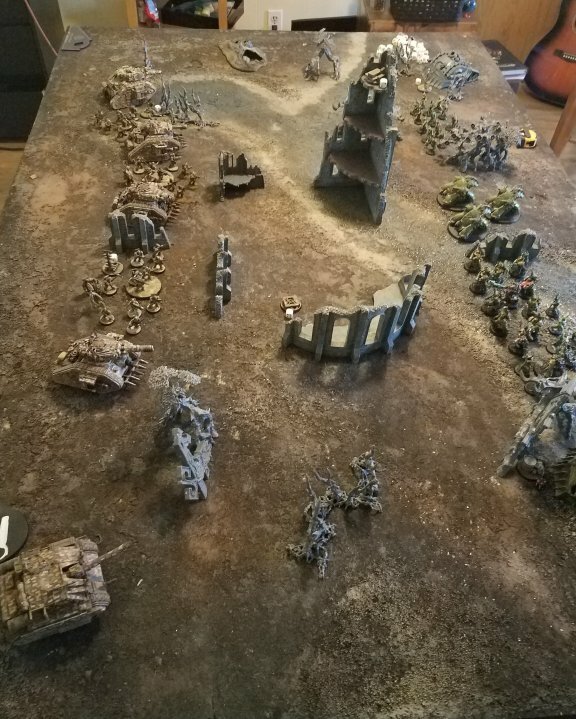 My Traitor (Valhallan) Guard vs Death Guard. Of course, if I had taken pictures and notes, I'd have a proper battle report, but..... nah. A rough rundown of the army. I had 4 Leman Russ Tanks, a Basilisk, 3 basic infantry squads, a psyker, a commisar and two commanders. Plus a Thunderbolt fighter for air support. Against two Plagueburst crawlers, 10 Deathguard marines, 3 Blight haulers, a psyker, Typhus, 5 terminators and a 2 mobs of poxwalkers. 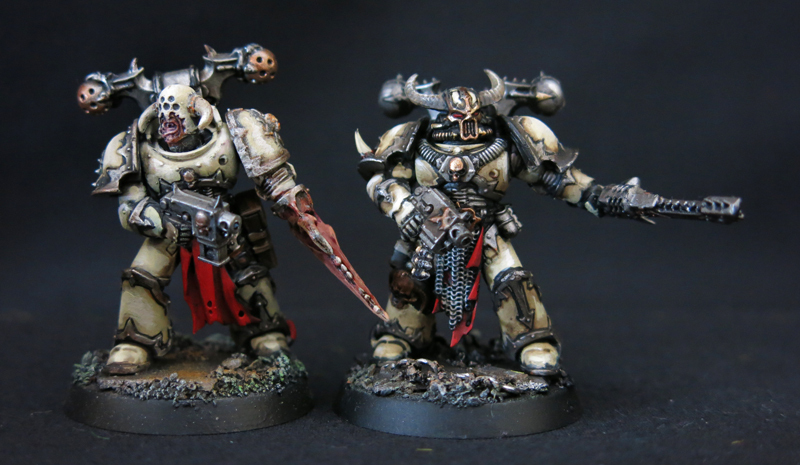 Always great fun for me to fight Death Guard since I have an army in the wings, nice to see how hardy they are, etc. And they are not a push over..
What's left of the Cathedral of Saint Bubba, Patron Saint of Bud Light and Duct Tape, lay in the middle of a scraggly looking forest. 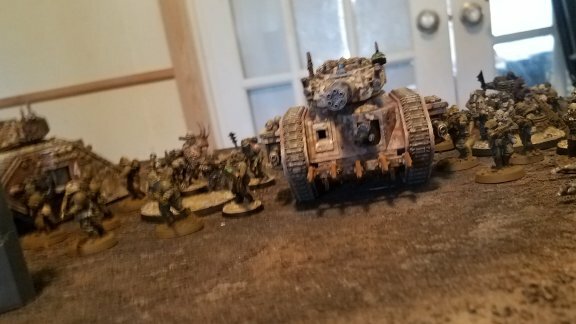 Death Guard had the first turn, fired on some of my tanks and killed a few of the guys in 1 infantry squad. My Punisher turned one of the Poxwalker units into paste and bodyparts in the return exchange(with some help from 2 squads of infantry). I put some wounds on the lower Crawler and I'm now a fan of Vanquisher cannons. My Demolisher in the middle apparently missed practice day at the range, not hurting the Blighthaulers, they in turn destroyed it on their turn, with help from the Lower Crawler. His terminators dropped in near the top of the board and I was only able to kill 1 of them by unloading the Punisher. (Damned Disgusting Resilience!!) They killed the One Leman Russ and teamed with the Blightcrawlers to finish off my commander and 2 squads/ The Punisher eventually fell after about 2 turns of massed fire. The wierd things? Cool things? I actually rolled good , for a change. I still can't hit 80% of the time with a missile launcher (we really need to stop buying those from the Ork blackmarket) My normal opponent rolled really bad, for him.....except those damned Disgusting Resilience saves. If you are rolling halfway decent that saves a TON of damage. I'm excited to actually build my Thunderbolt (instead of using Budgie the StormTalon as a stand in) That has turned out to be worth it points every game so far. Masses lasgun fire can be scary.... I'd love to try it against targets I could stand a decent chance of hurting someday. Tactical Objective cards can be fun. The whole addition of the cards into the game this edition is one of my favorite aspects. That's all for now. I've got sculpting to do. More on that next! Imperial guard, great when they work, not when they don't !!!! Hurrah for your despicable traitors ! Get on with the T-bird ! The Thing from The Lake: The Belly Sessions.